Last Monday, on my birthday of all days, I received my first Vegan Cuts Beauty Box! What an awesome surprise! I didn’t even need to leave the house to treat myself that afternoon. 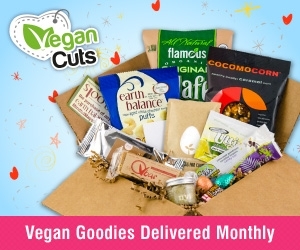 Vegan Cuts is a company, run by a small team of who I’d like to think are amazing people (I bet they are) and they are out to encourage all of us to shop with vegan ethics – No animal products – No animal cruelty. They do this by making us aware of companies that support those ethics. 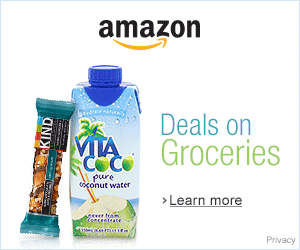 You can subscribe to the Beauty Box, the Snack Box or both! I subscribed to both because a) I love presents b) I like surprises c) I like learning about new products and companies that help me buy smarter. Since committing to veganism last November I’ve slowly made better choices that support cruelty-free ethics. I want to continue that path. 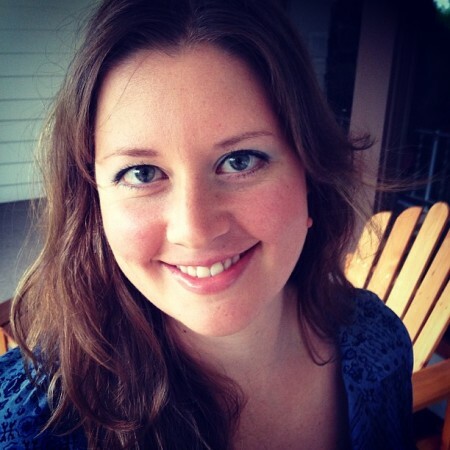 It helps me, the animals, the environment and supports small business and entrepreneurs alike. September contained (see above pic): BWC rosemary mint tea tree shampoo (2 fl oz), Various Weleda body lotions (4 – 0.68 fl oz), Weleda citrus refreshing body oil, Hurraw! 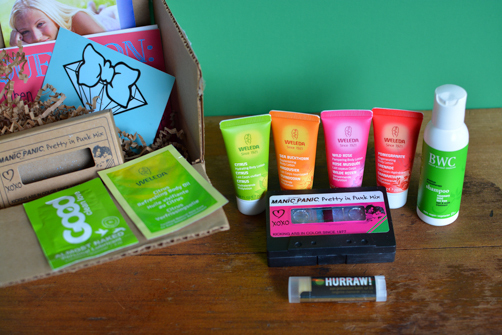 Tangerine Chamomile sun protection lip balm (0.15oz), Good Clean Love almost naked personal lubricant, Manic Panic eye shadow, a url for a free pantyliner ($12.49 value), a 10% discount code for Swagger cosmetics, and a pamphlet on other BWC products. Let’s start with what I used first! Beauty Without Cruelty’s shampoo (2 fl oz). It was the afternoon and I hadn’t showered. Perfect timing. 🙂 The scent is rosemary mint tea tree and man did it smell good! It reminds of the Aveda rosemary mint shampoo. For being sodium-laurel-sulfate free, I was surprised at how well it lathered and felt good going into my hair. It didn’t come with conditioner so I skipped it that day. My hair dried great, smelled good and wasn’t frizzy. This shampoo is also paraben-free, made with 100% essential oils, and doesn’t contain any synthetic fragrance. 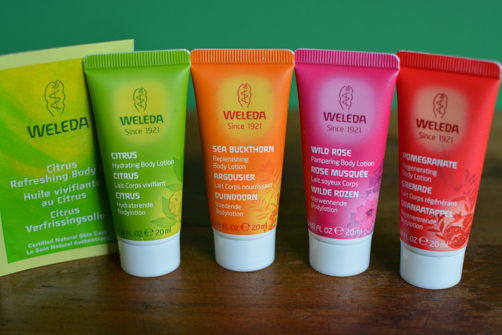 Weleda body lotions! I’ve used all of these at some point over the last week. Sometimes just on my hands and other times on my body after showering. You can tell immediately that they aren’t petroleum based. They feel thin going on but not watery and definitely not greasy. I was surprised later when my legs were still moisturized but they do contain many natural oils so that makes sense. I loved all the scents although the pomegranate is probably my least favorite: citrus (lime! all I could think was gin & tonic ;)), sea buckthorn (which I think smells like an herbal orange creamsicle), wild rose (light rose water scent), and pomegranate (light oil scent). I haven’t used the citrus oil yet. The Hurraw! 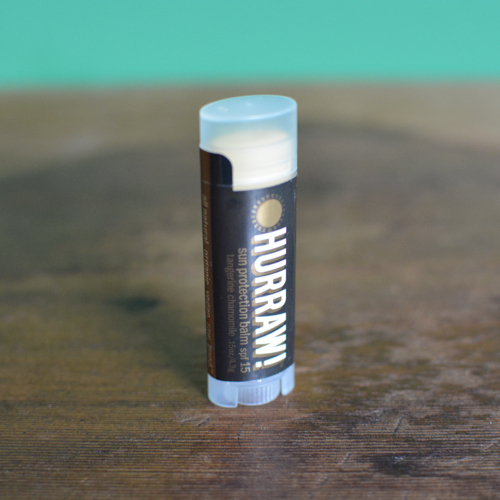 lip balm is heavenly. It has a light scent of tangerine and seemed to last for a long time. 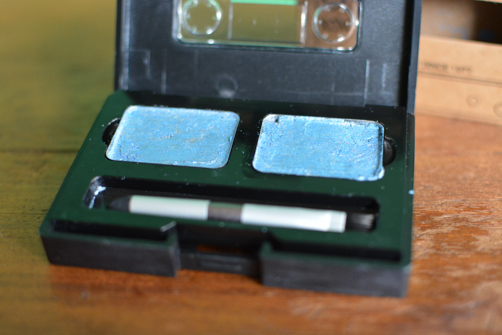 Last but not least, eyeshadow! 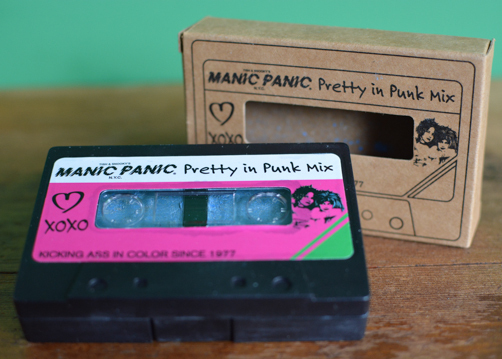 Manic Panic’s Pretty in Punk Mix. I loved everything about this product, the case, design, color, and the outer box—gah! My high school self and current self love it! Vegan Cuts replied to my instagram picture almost immediately and said to send them a note, they’ll get something extra into my box for next month. Good service. I’m going to use this as an opportunity to show you how to fix this type of calamity. Maybe you didn’t order eyeshadow in the mail, maybe you just dropped it on the bathroom floor. It is salvageable – well what stays in or around the case is salvageable. Once emptied, wash the case to remove any stray particles and then set it aside to dry. Grab that disinfecting rubbing alcohol from your medicine cabinet. 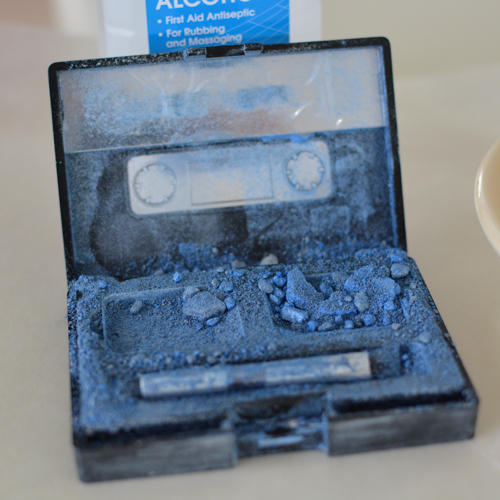 Add a few drops of alcohol to the eyeshadow powder and stir. You don’t want a liquid, you want something like a powdery paste—just enough that it will stick together. 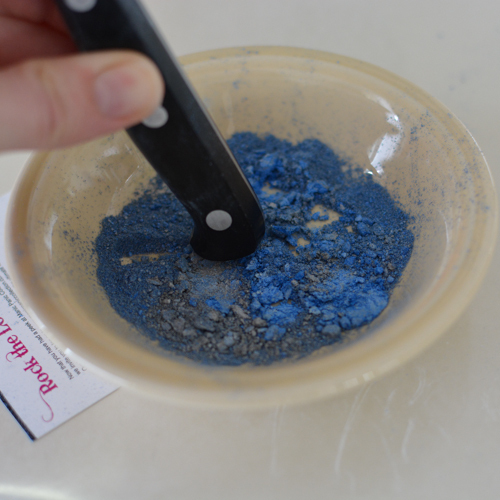 Using a flat spatula, scoop it and press it into the eyeshadow pallets. These were little metal ones that were held into the case by magnets, easy to get out and in. 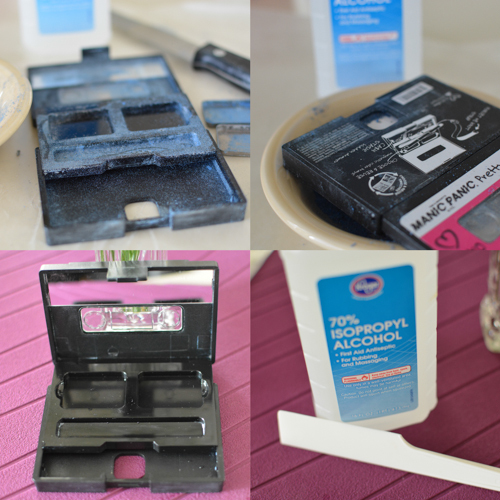 Use the wax paper or the underside of the other tin to do a final uniform press. Miraculously I was able to turn it into this. It’s not perfect but it is useable and ‘together’. Easy enough save. I even wore it for our sushi dinner date. All in all I’m thrilled with my first Beauty Box! I have a feeling my September Snack Box is arriving this week, so look forward to that. I can’t wait for October. Have you converted all of your beauty products over? What are your faves and what was hardest to find a replacement for? I think shampoo is easy. Deodorant I’ve inadvertantly been buying vegan for years. I recently and successfully started making my own. Mascara and toothpaste are probably my worst enemies left. I have that yellow and purple Mayballine mascara that has the most perfect wand but over the weekend I was looking at some vegan mascara paste that I’m willing to try. Toothpaste, I feel like I’ve tried all the natural vegan brands. They all leave something to be desired. Maybe I should try my hand at making my own? P.s. 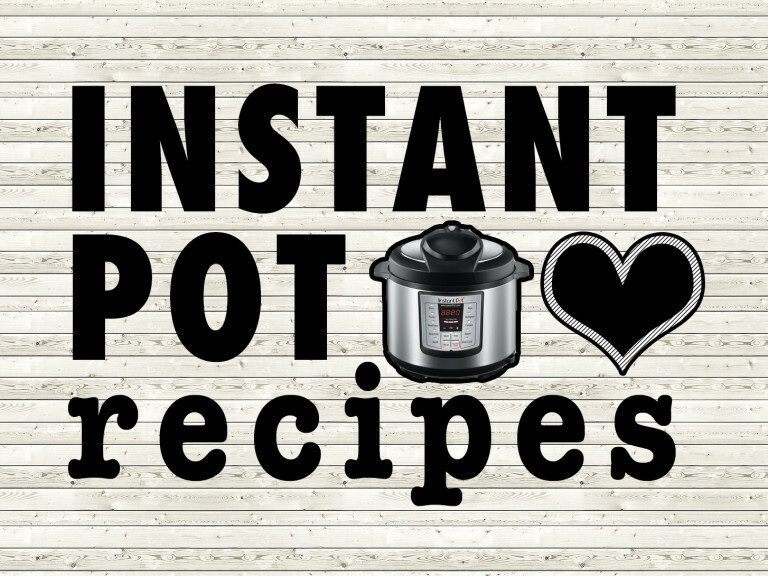 If you are interested in checking out Vegan Cuts, click here. 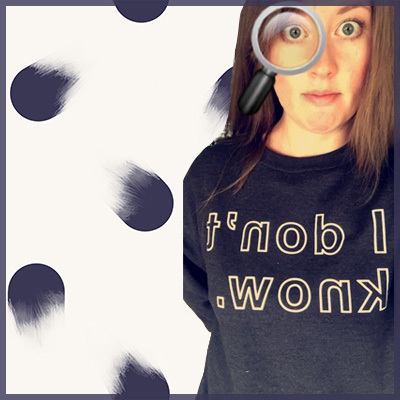 I became an affiliate ambassador at the same time I bought my subscriptions. I’d be happy to answer any questions you have or point you in the right direction, or hang out and watch my reviews to see if they’re something that interests you. 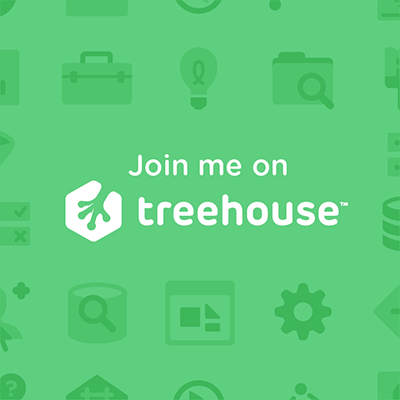 If you want to be an affiliate ambassador, there’s more information here. 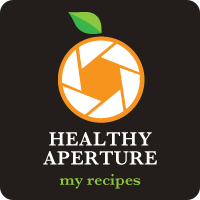 First, I keep forgetting to tell you how awesome your logo is!!! 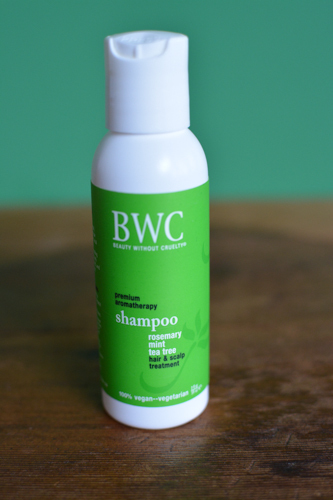 Second, I’ve been using the BWC shampoo for a couple months and absolutely love it. I can’t believe you re-conditioned the eye shadow; that’s a huge inspiration! Thank you Lauren! I’m glad to hear you like BWC, I’m definitely going to look at them further, it’s nice to find a good natural shampoo.